The Doğan Group, which owns one of the biggest media companies in Turkey, has put the blame on the faith-based Gülen movement for a record tax fine imposed on the company in 2009, claiming that Gülen-linked inspectors were behind the astronomical fine, according to a story in the Hürriyet daily on Tuesday. The Finance Ministry’s tax authority fined firms controlled by the Doğan Group TL6.8 billion (around $4.5 billion) for unpaid taxes in 2009. Back then, the record tax fine was seen as politically motivated and raised media freedom concerns in the country. The Hürriyet daily reported in its story on Tuesday that the tax inspectors who imposed the record fine on the Doğan Group were affiliated with FETÖ, a term coined by the Justice and Development Party (AKP) government and President Recep Tayyip Erdoğan to refer to the Gülen movement as a terrorist organization despite the lack of any court decision recognizing the movement as such. The daily said all those tax inspectors who were behind the record tax fine imposed on the Doğan Group in 2009 have been fired due to their links to the Gülen movement in the aftermath of a failed coup attempt on July 15. More than 115,000 people have been purged from state bodies, in excess of 90,000 detained and over 39,000 have been arrested since the coup attempt. Arrestees include journalists, judges, prosecutors, police and military officers, academics, governors and even a comedian. Critics argue that lists of Gülen sympathizers were drawn up prior to the coup attempt. Hürriyet said 10 out of 11 tax inspectors were expelled from their posts through government decrees which have the force of law because of the emergency rule that went into effect in the country following July 15. According to the daily, two of the 11 tax inspectors have been detained due to their alleged links to the movement, while one has fled abroad to avoid detention. The daily said the tax inspectors were sent to the US one year after writing reports about the Doğan Group as a “reward,” and the group realized at that time that the record tax fine imposed on the group was an operation masterminded by the Gülen movement. “The conspiracy that was noticed at that time but was impossible to be proved has been obvious through the expulsions by government decrees after July 15,” wrote Hürriyet. However, the Doğan Group and its media outlets at the time held the AKP government and Erdoğan responsible for the record fine, claiming that it faced the fine due to its coverage of government corruption. An article published in the Hürriyet Daily News, the English language newspaper of the Doğan Media Group, on Aug.9, 2009 said a second fine imposed on the Doğan Group in 2009 was imposed following then-Prime Minister Erdoğan’s call to the public to “boycott” the company’s newspapers. “Many in Turkey and abroad think the fines are of a political nature, while some say the government is intent on ‘creating its own media’ and sees DMG, which owns two of Turkey’s biggest and most influential newspapers Hürriyet and Milliyet, as the biggest obstacle. Such claims received even more attention after the Sabah-ATV media group, previously seized by the state-owned Savings Deposit and Insurance Fund, was sold to Çalık Holding, whose media arm Turkuaz includes PM Erdoğan’s son-in-law as its top manager. After the sale, the group is widely regarded to be treading a path that backs government policies,” the daily wrote back then. In 2009, Erdoğan publicly criticized billionaire media magnate Aydın Doğan, who owns the Doğan Group, and called on his party’s supporters to refrain from buying his group’s newspapers. Doğan claimed it faced unprecedented tax penalties because of its newspapers and television stations’ critical coverage of the government in 2008, particularly over corruption allegations. Today, the group is being criticized widely for turning into a government mouthpiece out of fear of being taken over by the AKP government. The AKP government has taken over or closed down hundreds of media outlets in the country including Turkey’s best-selling newspaper Zaman and has jailed around 145 journalists due to their critical views. 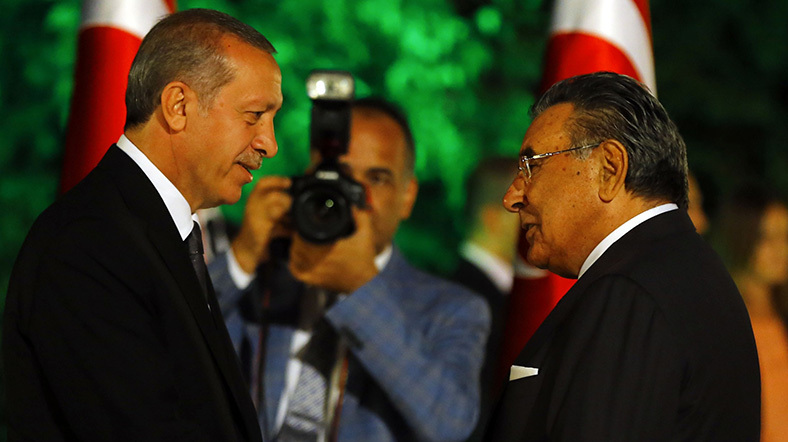 In two different leaked voice recordings back in 2014, Erdoğan was heard asking former Justice Minister Sadullah Ergin to interfere in a trial in order to arrange a conviction of Aydın Doğan, who was at odds with the government. This article originally appeared in Turkish Minute on Dec. 7.